"D.I.Y. & (very) Indie & Post-punk 77-81 from UK South coast, Brighton-Bournemouth. Throughout the age of Punk, the South Coast was emphatically ignored by the English music press, the major labels, and the established indies. Their neglect blurred lines between potential chart acts, Rough Trade prospects, and deliberate D.I.Y., so that the South Coast scenes (though still insular) remained highly varied. "D.I.Y." became less a choice than a necessity, but outside of the growing Mod scene hardly anyone put out records on their own. Instead, the best documents of South Coast postpunk were a handful of excellent local compilations and a raft of barely-circulated tapes - which account for a majority of the tracks here... Messthetics purists may note with alarm that almost every band on #108 had a proper drum-kit (sacrilege!) and also performed regularly in public. 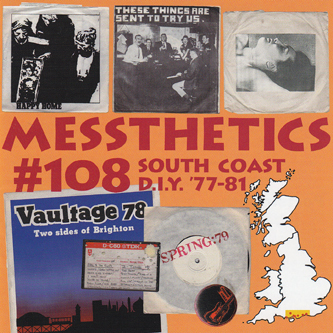 Still, all should find the selection reassuringly typical - and we should point out that Messthetics #108 is our most expansive collection yet!"